It appears that once again, the technological genie has been unleashed from its bottle. Summoned by an unknown person or persons at an uncertain time in history, the genie is now at our service for another kick at the can- to transform the economic power grid and the old order of human affairs for the better. We’re not talking about the social web, artificial intelligence, big data, robotics, or even self-driving cars. 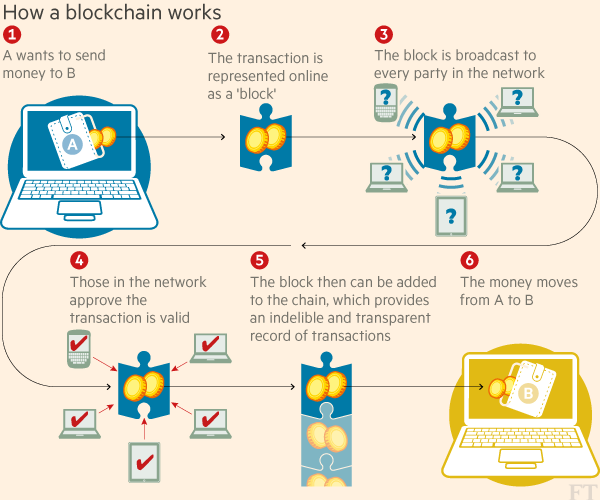 We’re talking about the blockchain, the technology behind digital currencies like Bitcoin. Block. Chain. OK, not the most sonorous word ever– it sounds like a combination of blocking and tackling and chain gang. Sonorous or not, this technology represents nothing less than the second generation of the Internet, and it holds the potential to transform money, business, government and society. Let us explain. The Internet today connects billions of people around the world. It’s great for communicating and collaborating online. But because it’s built for moving and storing information and not value, it has done little to change how we do business. When you send someone information like an email, PDF, PPT, or JPG, you’re really sending a copy not the original. Depending on the rights granted to recipients, they may be able to print a copy of these files. But under no circumstances should you print, say, money. So with the Internet of information we have to rely on powerful intermediaries to establish trust. Banks, governments, and even social media companies like Facebook work to establish our identity and ownership of assets. They help us transfer value and settle transactions. Overall, they do a pretty good job -- with limitations. They use centralized servers, which can be hacked. They take a fee for their services – say 10 percent to send money internationally. They capture our data, not just preventing us from monetizing it, but often undermining our privacy. They are sometimes unreliable and often slow. They exclude two billion people who don’t have enough money to justify a bank account. In sum, they capture a lopsided share of the benefits of the digital economy. Enter the blockchain, the first native digital medium for peer to peer value exchange. Its protocol establishes the rules—in the form of globally distributed computations and heavy duty encryption—that ensure the integrity of the data traded among billions of devices without going through a trusted third party. Trust is hard-coded into the platform. That’s why we call it the Trust Protocol. It acts as a ledger of accounts, a database, a notary, a sentry, and clearing house, all by consensus. Every business, institution, government, and individual can benefit in profound ways. The blockchain is already disrupting the financial services industry. How about the corporation, a pillar of modern capitalism? With this global peer-to-peer platform for identity, reputation, and transactions, we will be able to re-engineer deep structures of the firm for innovation and shared value creation. And how about growing social inequality? Through the blockchain, we can go from redistributing wealth to distributing value and opportunity fairly in the first place, from cradle to grave. Including billions of people in the global economy: protecting rights through immutable records like land titles; creating true sharing economy by replacing service aggregators like Uber with distributed applications on a blockchain; ending the remittance rip-off and helping diasporas return funds to their ancestral lands; enabling citizens to own and monetize their data (and protect privacy) through owning their personal identities rather than identities being owned by big social media companies or governments; uunleashing a new halcyon age of entrepreneurship by enabling small companies to have all the capabilities of large companies; helping build accountable government through transparency, smart contracts and revitalized models of democracy. So rather than just re-distributing a posteriori, wealth we can pre-distribute a priori by democratizing the creation of wealth in the first place. Don Tapscott is the author of 15 widely read books about technology in business and society, including The Digital Economy, Growing Up Digital and Wikinomics. His son Alex Tapscott is CEO of Northwest Passage Ventures, a firm that helps startups in the blockchain space. Their book Blockchain Revolution: How the Technology Behind Bitcoin is Changing Money, Business and the World was released May 10, 2016. Parts of this article were previously published in Time.